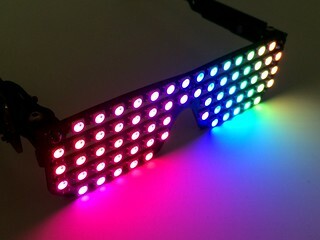 After a lot of work and frustration, we've finally launched the RGB LED Shades on Kickstarter! 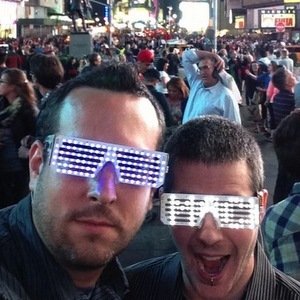 "We're excited to announce our newest piece of wearable electronics: RGB LED Shades! They're colorful, bright, hackable, and the pinnacle of conversation-starting technology. A fun way to learn programming and electronics, yet just as entertaining for experienced tinkerers. But if you need a stunning fashion accessory without writing code, they're pre-loaded with dazzling patterns out of the box!" Submitted by Garrett on Thu, 09/25/2014 - 17:29. Deep discounts on ShiftBrites and MegaBrites! 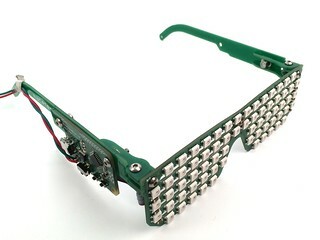 The ShiftBrite 2.0 is a redesign of the very first macetech product. It's a bright RGB LED module that uses a simple shift register control method to output 30-bit color. 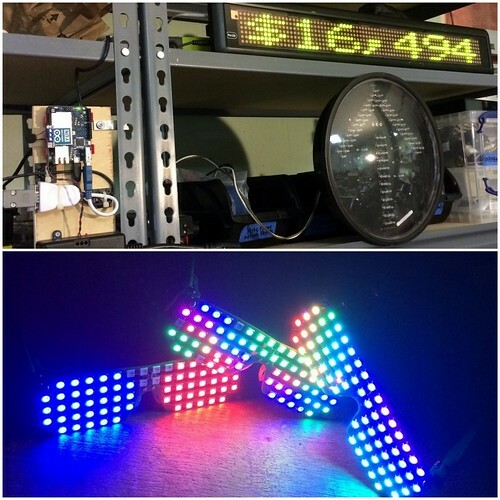 Most RGB LED solutions can only do 255 brightness levels per color; the ShiftBrite can do 1023. It has a sturdy mounting hole pattern, and 6-pin connectors that match our cables for trouble-free mounting, hookup, and maintenance. The Headerless ShiftBrite 2.0 is the same as the regular ShiftBrite, except that the headers have been left off for more flexible hookup options. You can solder your own headers (straight or angled), another 0.1" spaced connector, or just use wires. This is a good option for tighter spaces. Submitted by Garrett on Tue, 07/22/2014 - 10:15. My friend Scott randomly dropped by the macetech LLC lab up here in Pullman, WA. He brought a cool thing to show off...a big array of 60px/m RGB pixels using the WS2812 LEDs. It's very bright in person and I was impressed with the matchup of the 60px/m LED spacing and the fluorescent lighting louver grid. I've definitely used the grid in a lot of projects, but never made that connection! His controller uses a custom WS2812 library running on a Digilent chipKIT Max32 with plenty of CPU power to spare. Submitted by Garrett on Sat, 07/19/2014 - 00:11. 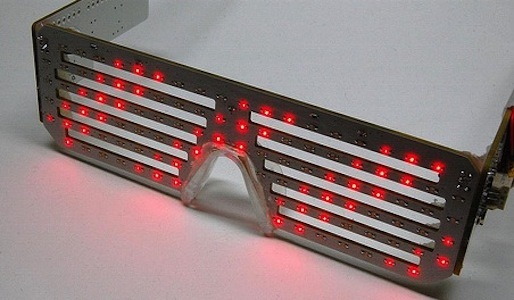 We've got a new article over on Makezine today, showing how I added an audio-detection circuit to both the RGB Shades and the LED Matrix Shades. The result was REALLY cool and finally used the extra pins I'd made available on both designs. Audio detection is just the beginning...I have a few more ideas for sensors to add to LED Shades, and it would be great to see your suggestions. They might make it into another video! Submitted by Garrett on Fri, 07/18/2014 - 23:15. The big event of the maker movement, O’Reilly Bowl *cough* I mean Maker Faire Bay Area 2014, happened last weekend (May 17th and 18th). As with most words used to describe Maker Faire, “happened” is a little insufficient. It’s a tremendous and complicated event that requires a massive effort from everyone involved…the O’Reilly Maker Faire team, the Maker Shed, the sponsors, the performers, the speakers, the exhibitors, and the event staff. And one more group that I didn’t fully appreciate until this year…the attendees (let’s call them participants). This was the first year at Maker Faire Bay Area that I was not an exhibitor, and instead wandered the exhibits and crowds. It was amazing and exhausting, just as much as if I’d been running an exhibit table. Submitted by Garrett on Mon, 05/26/2014 - 14:53.